This is the Inheriting The Kingdom Series: Joy, Peace, Patience, Love, Kindness, Goodness, Faithfulness, Gentleness, and Self-Control. You may now enjoy this complete series which is 27 Hours of teaching all together. This is a $7.00 saving for you. This is the Inheriting The Kingdom Series: Joy, Peace, Patience, Love, Kindness, Goodness, Faithfulness, Gentleness, and Self-Control. 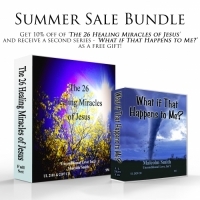 You may now enjoy this complete series which is 27 Hours of teaching all together. This is a $16.00 saving for you. Eternal life is described as knowing God. These messages comprise a systematic study focusing on the many facets of who God is. Virtually all of our problems with living life as Christians are due to a faulty or incomplete concept of God. Please see the following numbers for a description - 1681; 1705 & 2539. Available in CD format only. Please see the following numbers for a description - 1681; 1705 & 2539.